the scan made it hard for me to see, it's so bright on the top I had to make up that shading portion. I saw I added alot already and didn't want to overcrowd it. 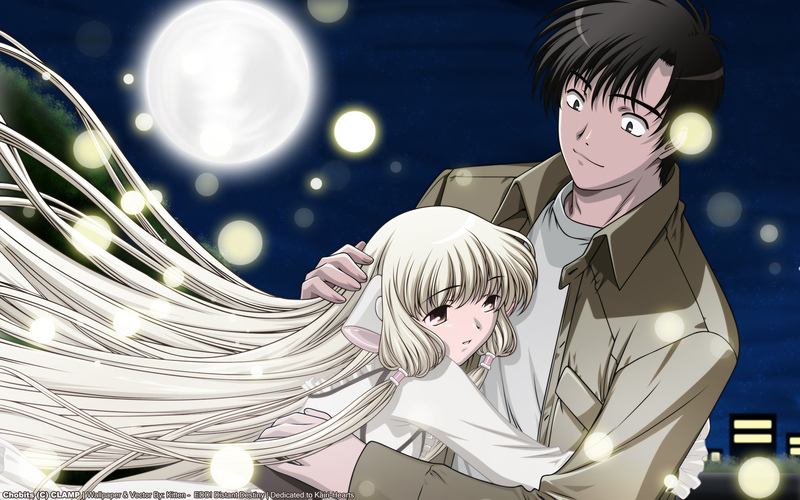 look somewhat like the ending of Chobits with the "Ningyo Hime" song. I added trees and a rail to give it a park night look, and added sparkles around them for a somewhat magical feel. After I made the lighting and adjusted the vector to how I saw fit according to the walls color scheme. Love her hair and the lights! I always enjoy those kind of walls! how I wish my life didn't get so complicated all of a sudden! just know that I love this! Love the scan you picked, how you worked it! that's sooo nice! They are so tender and sweet! It looks amazing! It might have given you a lot of work but it really paid off. Love it! QUE BUENA IMAGEN DE CHII Y HIDEKI! ILove Chi and hideki; so what could probably happen to the both of them? an excellent image of this beautiful couple ... Thanks for sharing. ahhhhhh who nice for those two they look nice together.